Making a rare foray into the realms of physical exercise, I cycled across Kompong Cham’s bamboo bridge (more of which later) onto Koh Paen, a small island in the Mekong river. Countless small children called “hello!” as I rattled inelegantly past stilt houses and rice fields in the late afternoon sun. 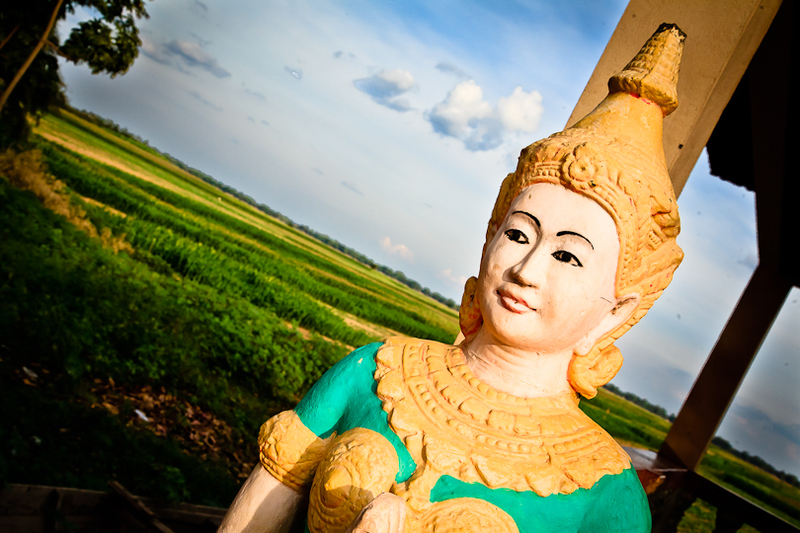 Many of the rice fields in this part of Cambodia are overlooked by small, open pagodas, as in the picture above. Love the angle of this..
Beautiful picture in a beautiful place – and so green! !! Travelling from by slow boat from the bridge in Kompong Cham to stay with friends in Krach Chhamar, at the same time of year , the fields had roasted tan.